We would like to express our gratitude to our summer volunteer, Natalie Hianik. Natalie learned about Pack for a Purpose when her sister traveled to Zambia with their high school, Ravenscroft and took supplies for two projects on the PfaP website. As part of her school’s senior year internship requirement, Natalie choose to volunteer at Pack for a Purpose. Once that time period ended, Natalie has continued to volunteer at Pack for a Purpose throughout the months of June and July. As a volunteer, Natalie helps to maintain content on the website by editing and uploading new photos as well as adding new accommodations, countries, and tour companies as needed. She also edits content, communicates with individuals, accommodations, and tour companies interested in Pack for a Purpose, and composes social media posts. Natalie starts as a freshman at the University of North Carolina in Chapel Hill in August. She plans to study chemistry and eventually become a chemical engineer. 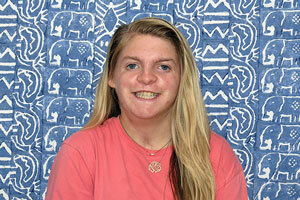 While at UNC, Natalie also plans on studying abroad in Africa for a month in the summer or for a whole semester. She has seen the benefit Pack for a Purpose travelers have had in communities all across the globe, and hopes to contribute to the positive impact during her visit to Africa. We also hope she will work here next summer!